The model shown is built with the Wilderness embellishment, but it can be built in the Standard and Burl embellishments as well. The door is swung open to allow us to see the interior, shelves etc. 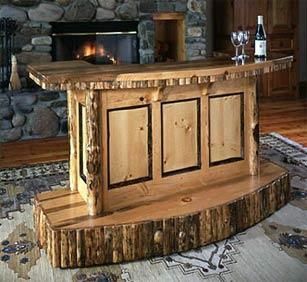 The bar comes with the shelves shown and has doors attached. 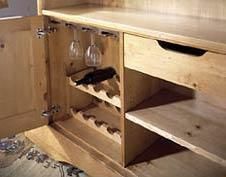 The stemware rack and the wine rack are options that can be ordered to customize the design.